The former Environment Minister says brewers should be allowed sell their own products on site. Alan Kelly, and some craft beers. IRELAND’S CRAFT BEER industry could be in for a boost if Labour’s new bill gets cross-party support. Alan Kelly, the former Environment Minister, has proposed removing regulatory barriers for breweries, microbreweries, cider makers and distilleries which prevent them from selling their products on their own premises. Many distilleries are marketed as tourist attractions which offer guided tours. However, the Labour TD said that much to the frustration of their owners, they cannot offer beer tastings to their visitors and cannot sell their products. “The ability to capitalise on this potential for ‘craft-beer tourism’ is being hampered by current licensing regulations, which require producers to have a pub licence or an off-licence to sell their produce, made on site, to tourists and visitors,” he said. For example, can you imagine a situation existing in Italy, France or Spain, where tourists visiting vineyards are prevented from purchasing wine at the end of their tour? Microbreweries employ 439 full-time workers around Ireland and are located in 23 of the 26 counties. Irish microbreweries will have a projected turnover of €59 million this year. Kelly said the new measures would not be a threat to publicans as there are safeguards included in the proposed bill which would restrict the time period in which beer products can be sold. It’s proposed there would be a 6pm cut off. Breweries would only be allowed to sell their own products on site and fines would be imposed if they were found to be selling alcohol from elsewhere. “It is an industry that has tourism potential… It will bring more jobs to regional areas,” Kelly said, adding that he had had many representations from brewers calling for the measures to be introduced. The bill was about enterprise, tourism promotion and dealing with an “anomaly” that needed to be dealt with, he said. James Ward, founder of Sligo’s Lough Gill Brewery, welcomed Kelly’s initiative as a “brilliant idea”. The bill would remove “a major regulatory barrier,” for business-owners in the sector, a statement from Ward said. The Tipperary TD, who as Environment Minister spent much of his time dealing with questions about Irish Water, was asked to name his favourite Irish craft beer as he spoke to reporters yesterday at the Dáil. 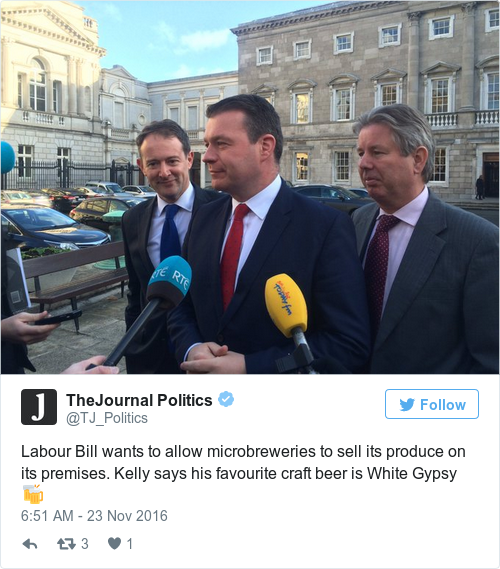 Unsurprisingly, he picked a brew from his own constituency – White Gypsy of Templemore. Cork TD Sean Sherlock, speaking alongside Kelly at Leinster House, went for the Mitchelstown-based Howling Gale Ale. Email “From Irish Water to Irish beer: Alan Kelly has a crafty plan to help brewers ”. 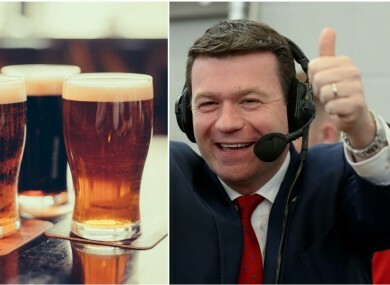 Feedback on “From Irish Water to Irish beer: Alan Kelly has a crafty plan to help brewers ”.